My lemon tree exploded. Well not really, it just decided to mass produce. This is a nice refreshing recipe, perfect for the summer. As I posted earlier Agave is a liquid sugar with a low glycemic index, and less calories than sugar. You cannot taste the difference. It is the perfect ingredient to use in summer drinks. Give it a try. 1. 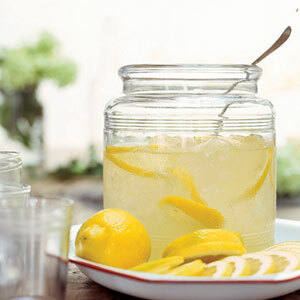 Combine the lemon juice, agave and water in a pitcher. I love agave in lemonade, it's a natural liquid sweetener too, so it doesn't leave sugar in the bottom of the glass.